From an early age, John Dillon had an interest in fine automobiles. In retirement, he took particular interest in antique cars. Over the years, he built an enviable collection. Headlined by his prized 1969 Chevy Camaro, John’s collection grew in value to over $500,000 dollars. On most days one could find John working on his vehicles in his meticulously kept garage. One Sunday afternoon, John cleaned and polished his antiques to a show room shine. Always the perfectionist, John ended the day applying a fresh coat of wax to the garage floor. Proud of his work, he admired his vehicles one last time and discarded his work rags to a plastic hamper in the garage. Several hours later, John was awoken to the unmistakable odor of smoke. His initial fear was confirmed when he peered from his bedroom window to see his detached garage ablaze. John reacted swiftly in calling the fire department but to no avail. When the smoke had cleared, his prized collection was a pile of charred metal and ash. 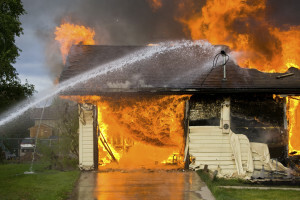 The county’s Fire Marshall Investigation, aided by John’s video surveillance system, determined the cause of the fire was spontaneous combustion originating within the container of rags in the garage. John promptly reported the incident to the Condon Skelly claims’ call center. The claims team took action swiftly and began the claims process. Appraisals of the damaged vehicles were secured within days and the claims adjuster reviewed them carefully with John. John received a settlement check for the full agreed value of his vehicle within weeks and has begun to replace his collection. 1) Wash/rinse the rags after cleaning his floor and cars. 2) If time was an issue, while not the preferred method, John could have stored the chemically soaked rags in metal containers and ensured the container was in a well ventilated area. Click here to download Condon Skelly’s guide for preventing spontaneous combustion. Although John would prefer to have his 4 prized vehicles, he was very vocal about how pleased he was with Condon Skelly’s prompt handling of his claim. He noted that it was a relief not to worry about the claim’s process involving his vehicles. At Condon Skelly, we know how important your exotic, classic and sports cars are. That’s why we specialize in offering complete car insurance for classic car and have a quick and easy claims service. We’re a group of collectors, enthusiasts, and professionals who specialize in insuring all types of collector vehicles. Our team is as passionate about protecting your vehicles as you are about collecting them. We can help you secure affordable, industry-leading specialty car insurance coverage to protect your classic, antique, or exotic vehicles. For more information, contact our classic car insurance specialists today at (866) 291-5694.